More flights to Area 51 than any other airline! NOTE: This page has not been maintained since 1995, and the flights have probably changed. Workers at the top secret Groom Lake (Area 51) and Tonopah Test Range (TTR) air bases commute to work aboard 737 jets from a not-so-remote terminal at McCarran Airport in Las Vegas. It is only two blocks from the Las Vegas Strip! On aviation frequencies, the jets are known by the company name "Janet," a name whose meaning is unknown [See glossary]. Each jet is a 737-200 (or CT-43, the military equivalent) with a single red stripe along the side and no company name or insignia. Smaller Beechcraft Kingair prop-driven planes make special trips to Edwards AFB and other destinations. ...So bring your security clearance and your visa card, because Janet will take you to Dreamland but they won't take American Express! Janet Equipment. Tail numbers and registrations. Flight Schedules. About twenty round-trips daily. Las Vegas Terminal Diagram. Layout of parking lot and local roads. List of observation points. Parking Lot Counts. Periodic inventory of cars. On-Air Glossary. Terms used by Janet pilots and controllers. Also: "Janet" name theories. Janet frequencies and reporting points. Frequencies in general use by aircraft in the Las vegas area. Aerial View of McCarran Airport (370k) Janet terminal is barely visible near pyramid. High Altitude photo of airport (250k). Janet terminal is just below diagonal runway. 6/20/96: Helicopter sighting. For the first time, I saw a helicopter land at the Janet terminal. It had the same paint scheme as the Janet 737s, with one horizonal red stripe and no obvious company name. I could not see any tail number, but I was quite distant and might have missed it. I took a distant photo with which the model might be identified. Your birds seen at Augusta,GA. approx. six times in past six months. N654BA with some kind of mechanical problems and diverted to Bush Field, Augusta,GA. N20RA landed in support. Rude pilots! Savannah River Project is just north of Augusta. It is a nuclear weapons and fuel processing facility of the DOE and run by Bechtel! `lt's just a national scandal that they would be flying a high U.S. delegation around in a war zone without the basic tools to determine the cause of an accident. 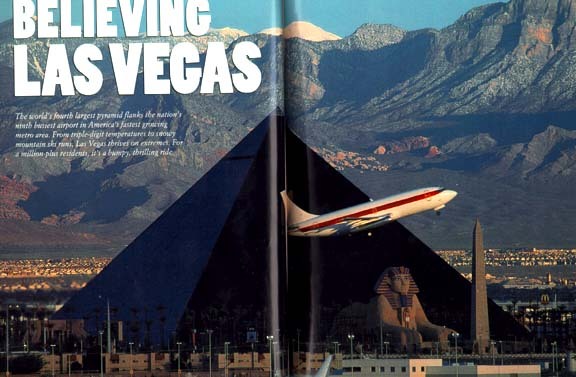 4/27/96: "Military Ordered To Put New Navigational Aids In Passenger Jets," Las Vegas Review-Journal , page 8A. WASHINGTON - In response to the plane crash that killed Commerce Secretary Ron Brown, Defense Secretary William Perry ordered the military services Friday to install new navigation aids on all their passenger planes. Help Needed! Visitors are invited verify this information and report any deviations or additions. Also please report sightings of same aircraft at other airports. +indicates documents stored on this server. Janet is simply and acronym for Joint Air Network for Employee Transportation. It is a joint operation to transport both military and civilian employees. RE:JANET I HAVE JUST FOUND OUT SOME VERY INTERESTING INFORMATION ON JANET AND AREA 51 AND A NEW TOP SECRET MIL STEALTH AIRCRAFT. THE AIRCRAFT IS KNOWN AS THE TR-3a BLACK MANTRA.THE AIRCRAFT HAS BEEN FLOWN FROM AREA 51 TO THE NORTH OF SCOTLAND AT NITE THE AIRCRAFT CAN FLY MACH 5-7 NON AFTERBURNING AND CAN FLY FROM NELLIS AFB TO MACRAHANISH AFB IN SCOTLAND IN UNDER 50 MINUTES. THE AIRCRAFT RIDES ITS OWN SHOCK WAVE LIKE A SURF BOARD. FOR MORE INFO EMAIL AT ABOVE AT PLEASE. RICHARD FOX INFORMATION FROM RADIO&COMMS MAY 1999 AUSTRALIA. The group known here as "Janet" airways is not reserved just for the NAFB. Its official title is an organization known as Civilian Personnel Flight. CPF is run by the United States Air Force and offers services to all Air Force related organizations. It's main headquarters is at Randolph AFB in Texas. Dragged my g-friend to Janet Terminal to take pics over T- giving. While there, black helicopter hovered over road. Took it's pic + others. We left the camera under seat in car and went into casino. Wasn't there when we came out. Joked with her that gov't took it. It still hasn't turned up, but when (if) it does, i'll try to send some to you guys.